Are you a hungry live music fan? Because I have 3 succulent and satifying live music news stories that’ll get you primed for the big feast later this week. You can start the face-stuffing early as I dish out a meaty live music meal that’s simmering with stories that made my mouth water over the last couple weeks. In other words, consider this a warm-up to get your belly ready for Turkey Day. First, for appetizers, I have updates to both the Ticketmaster/Live Nation merger and the back story to Michael Jackson’s This is It. And then for the main course we’ll jab our fork and knife and cut into the wonderful world of fan/user-generated content as LiveNation.com overhauls its site to continue their interactive and social media efforts. 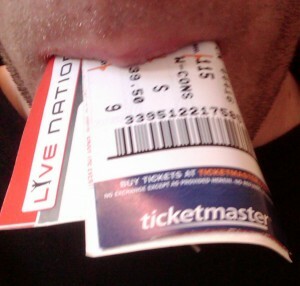 I’ve been keeping a close eye on the Live Nation Ticketmaster merger ever since it was announced. And since the last update this summer, it’s been pretty quiet on the merger front. It’s not a huge announcement but earlier this month Live Nation and Ticketmaster announced they will have a shareholders meeting January 8th to vote on the merger. That’s nice that they’ve picked a day to vote internally for the shareholders, but what really matters is what the U.S. Department of Justice says when they finally weigh on the merger of the “world’s largest concert promoter and ticket seller by volume.” I don’t expect any big news to come out in December but it’ll be a top story that I’ll continue to follow and keep you updated on as we roll into 2010. I always love getting the back story. And at the Billboard Touring Conference AEG executives shared some of the “behind-the-scenes” info on the production of Michael Jackson’s This Is It. Here are my favorite parts of the story that show Jackson’s commitment to remain the true concert King of Pop, the dedication of fans and how AEG Live always makes sure distance themselves from any responsibility for Jackson’s death. It’s also interesting how the number of shows mystery continues to grow with each report. The Jackson/AEG partnership resulted in a contract that initially included 31 dates, a number chosen by Jackson because it would be 10 more concerts than Prince performed. The number planned shows at the 02 Arena in London later grew to 50. Phillips says that 14% of ticket holders held on to their tickets, which were designed by Jackson himself. 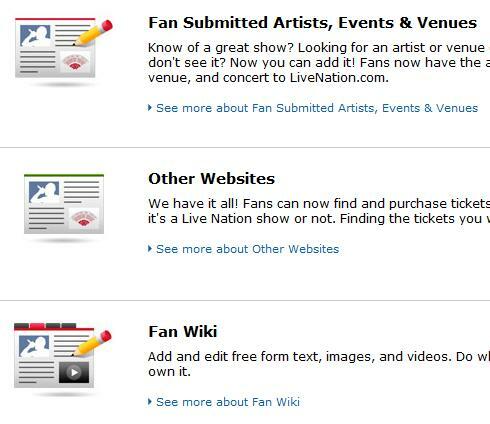 New User-Generated LiveNation.com: Good for business and fans? From music to hard news sites, user-generated content has been trending as the way to go for bands, brands and concert promoters. And with the growing popularity of social media and the advance of mobile technology, it’s never been easier for concert fans to capture and document their live concert experiences. As I mentioned before I’ve been checking out SPINearth’s and Verizon‘s approach and I’ve enjoyed being able to see a wide range of emotional insights from fans that I otherwise wouldn’t be able to see. Yes, the quality of the videos or the storytelling might not be the best, but I’ll tell you that I’ve learned a lot about what fans focus on during the concert, which in some cases, helps me write better reviews and understand why we love live music so much. As I’ve studied these user-generated content sites more this year, I’ve wondered about the true motives of the creators and developers. I wonder if it’s a crafty guise for promotion and market research. When I say this I’m thinking about Live Nation’s recently overhauled site as Billboard reports. Artists will be able to upload details of their own concerts, for instance, which will appear with the artists LiveNation is promoting. Fans will be able to submit entries to artist-specific wiki pages, ratings and reviews, moderate Q&As and integrate their Twitter feed to the LiveNation site. But I have my doubts, too. Are they really creating a community where fans have more power and expressive freedom? Or is Live Nation only interested in creating a slick market/research model that’s designed to find out more about their customers buying habits than their love for live music? I’ll give Live Nation the benefit of the doubt for now and say that it’s probably a mix of both because many of those working on Live Nation’s new fan section are not just savvy business people but are dedicated music fans themselves. For the most part, I’m all for fans having a way to share their experiences on these user-generated content site because it does give fans a voice. I just want to make sure all the voices are heard and their not being filtered or censored in a way that hurts fans. That said, as savvy concert fans, we should always be on the lookout and not get wooed into a completely mindless and relaxed state of entertainment. We should always be asking ourselves, are we being taken advantage of and does Live Nation really care about our life-changing concert experiences? I consider it a huge honor and a privilege to hear and share your concert stories. I just hope that Live Nation feels the same way. In addition to Live Nation’s new website, I’ve also been following their Facebook fan page and Twitter updates for awhile and I look forward to sharing what I find with you, too. That’s all the live music news for now.